My 528 Hemi project started out as an idea. I wanted to build the largest Hemi available. Mopar Performance offered a Mega Block with a bore of 4.5 in. This along with the stroke of 4.15 gives you a displacement of 528 cubic inches. Crate motors were basically unavailable due to the fact that the foundry that was manufacturing them went under. 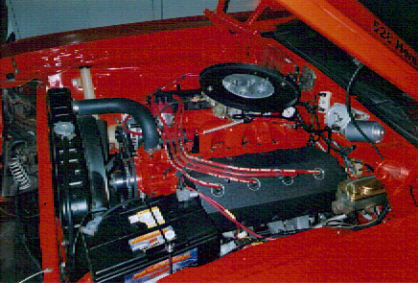 My only way to achieve my goal was if I bought all the pieces and assembled my own 528 Hemi. And that is what I did. It took me the better part of ten months to collect all the pieces. It seemed like every time I called someone about a specific part, they were in between runs and I would have to wait. After collecting all the machined parts, It took me a whole month to assemble the engine. Eleven months after I set out to build my dream, I brought it to life. The driveway was full of hoses and wires and without a hitch, It fired right up. About a month later it was time to put it in my Dodge Challenger with its pistol grip 4 speed. It went right in the engine compartment. Imagine what it was like to drive this car down the road with open headers on the way to get the exhaust hooked up. Once it was hooked up I drove my dream car-engine combo. for 1 year back and forth to work. The temptation to pass everybody in my way was constant. I got a few of those behind me! After high fuel consumption (fill ups every 80 miles) I decided to remove the engine. My dream was successful. My mission was complete. I build Hemi engines.